Badge of Honour — yes, spelled with a “U” because Canada — was going to consist of 60 metal lapel pins featuring the biggest NHL stars of the 1994-95 season. 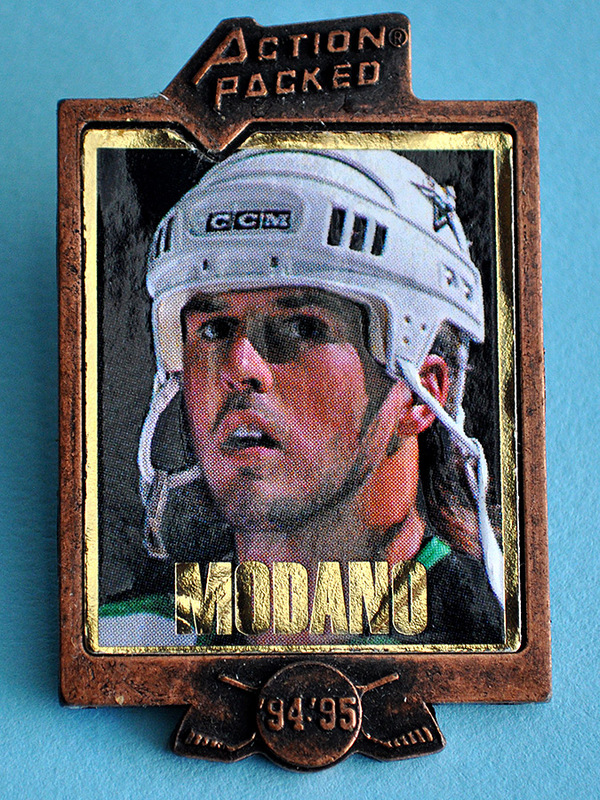 However, only four promotional pins were made: Doug Gilmour, Patrick Roy, Sergei Fedorov and Mike Modano. The four promotional pins came in a plastic tray, wrapped in a cardboard sleeve and sealed in plastic shrink wrap. These were given to card dealers in 1994 to encourage sales. The front of the Badge of Honour packaging has a window cut to reveal one of the pins. Even though the promo pin packs can be found with a different pin showing, all packages have the same four pins. 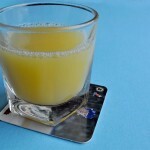 The pins measure 1.25″ wide by 2″ tall. 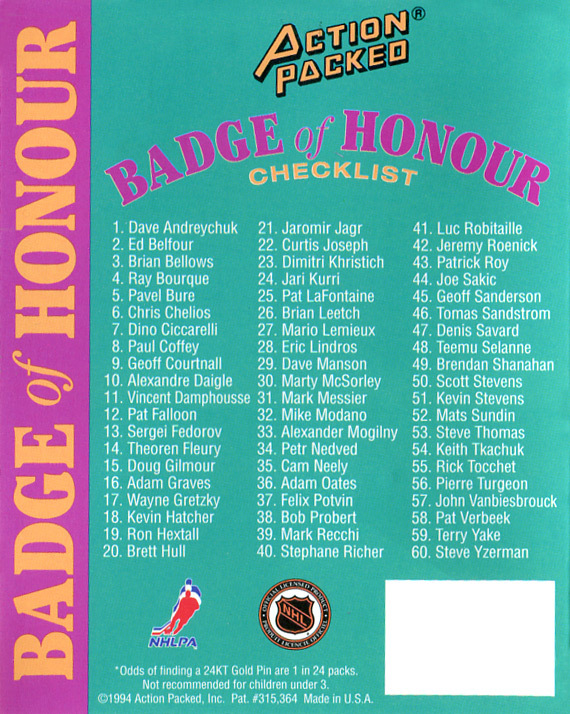 Due to the relatively small size when compared to a trading card, Badge of Honour pins show only players’ faces. 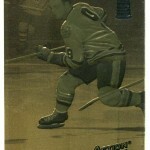 The portraits are surrounded by a bronze-colored frame with the “Action Packed” logo above and two crossed sticks and the season (94-95) below. Like Action Packed’s football cards, the pins are “puffy,” with the player’s face raised slightly off of the background. The pins are very reflective, and look kinda messed up when viewed in direct light. Had Badge of Honour been released, the packaging would probably have been close to what the promo packaging looks like. Remember, this was the mid-1990s, so the garish green, yellow and pink color scheme would have fit right in with the times. On the back of the packaging is a checklist of the 60 different available pins. 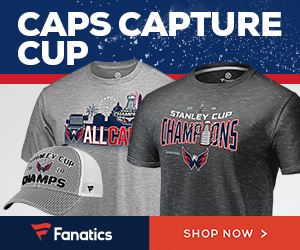 As this set had full licensing from the NHL and the NHLPA, all the big names are included: Wayne Gretzky, Mario Lemieux, Eric Lindros, Brett Hull, Jaromir Jagr and Joe Sakic. The 1994 NHL Lockout denied us the opportunity to buy and wear Terry Yake lapel pins. Boo! According to the packaging, one in every 24 packs of Badge of Honour would have a 24-karat gold-plated pin. That means one in every 96 pins — about 1% of the production run — would have been gold-plated. Action Packed advertisement from 1994. 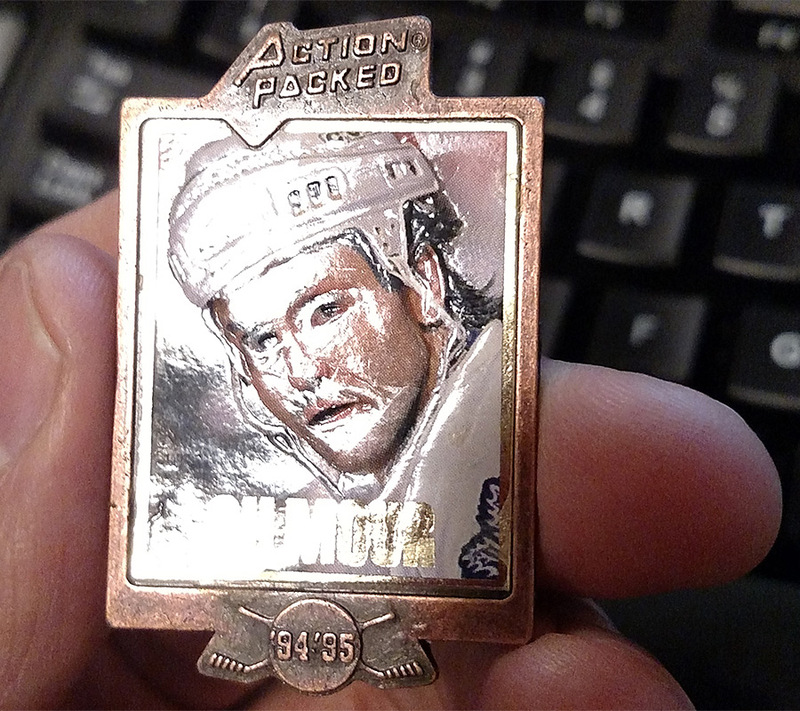 Heavy metal pins with gold-foil embossed portraits of the NHL’s greatest players. 24kt gold pins randomly packed. 60 players. But the NHL Lockout put an end to Action Packed’s foray into hockey before it even began. 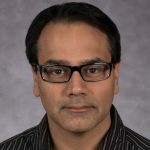 Interest in hockey cards declined while the NHL and its players engaged in labor negotiations, and retailers were loath to try new hockey products in a market that was already crowded to begin with. 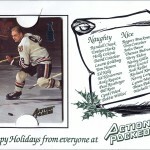 Thus, Action Packed never came out with any of these four sets, or its planned set of Hockey Hall of Fame trading cards. If Badge of Honour had come out as planned, I honestly would have not been too interested. 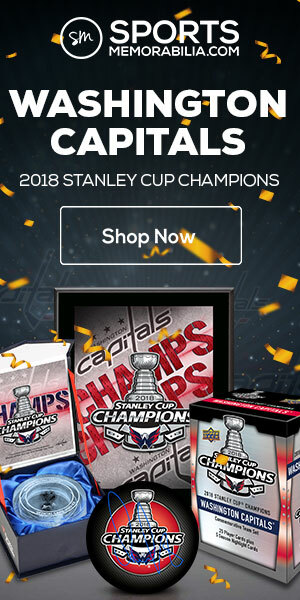 Sure, I probably would have bought a pack or two out of curiosity, but I was mainly into cards when it came to hockey collectibles. 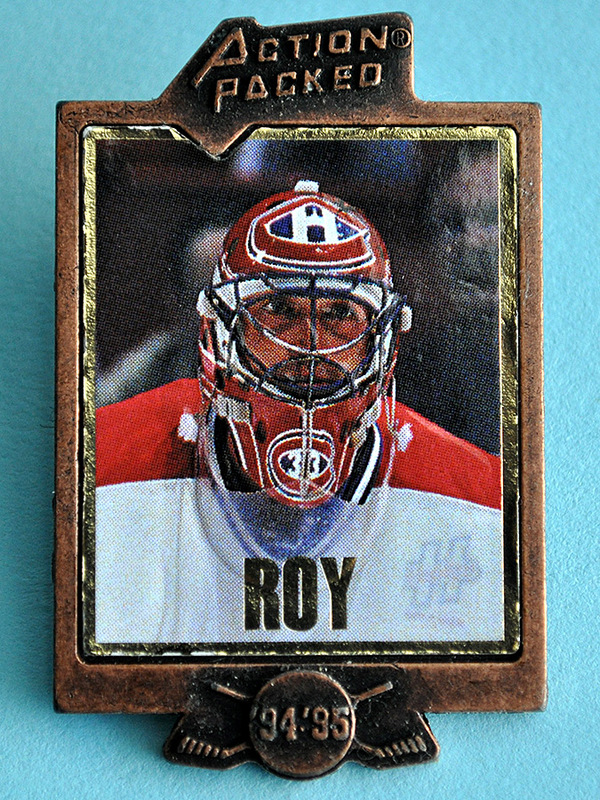 Still, a Patrick Roy pin on my school bag would have been pretty rad back then. I probably would have waited for a dealer to sell a Roy single and bought that, as long as it was below $25 (1995 money). 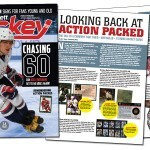 Hi Sal, Great article on these obscure Action Packed hockey pins. 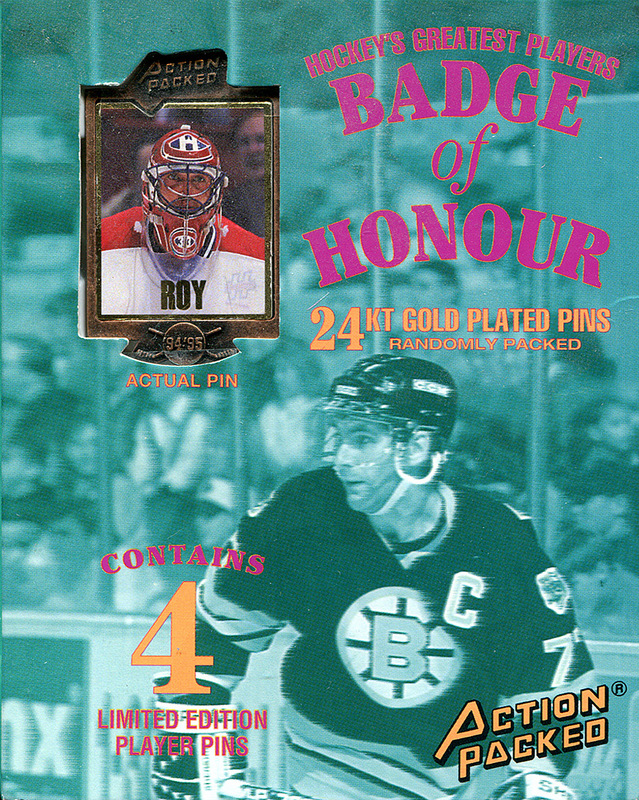 You wrote that there were 4 samples made but actually Action Packed had also produced a Gretzky prototype when first pitching the idea of making these pins. These were not inserted into the packaging that you described. This prototype was of course very limited to only a handful but did look identical to the ones pictured. Gretzky prototypes of the fold-out Big Picture card and Coastars were also produced. 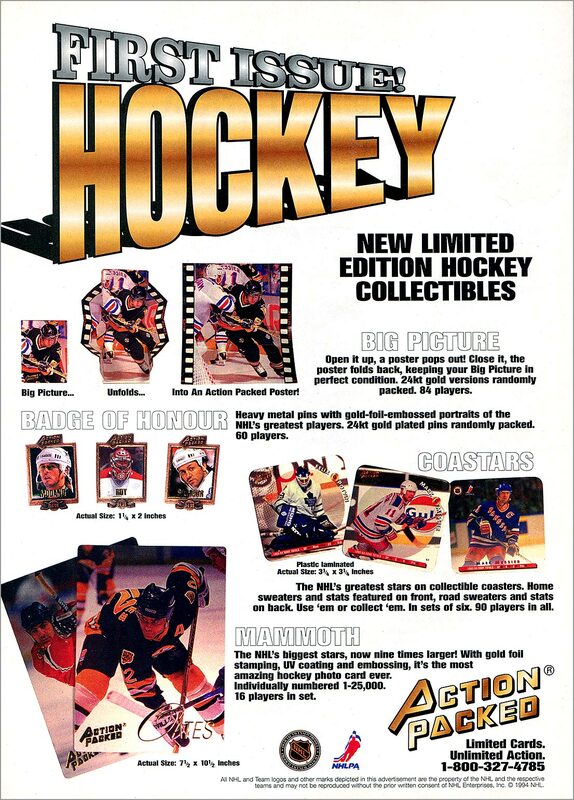 I personally think these Gretzky Action Packed items are very rare, unique and original and would be highly prized by Gretzky collectors out there. BTW, I am sorry I missed your contest earlier this month. 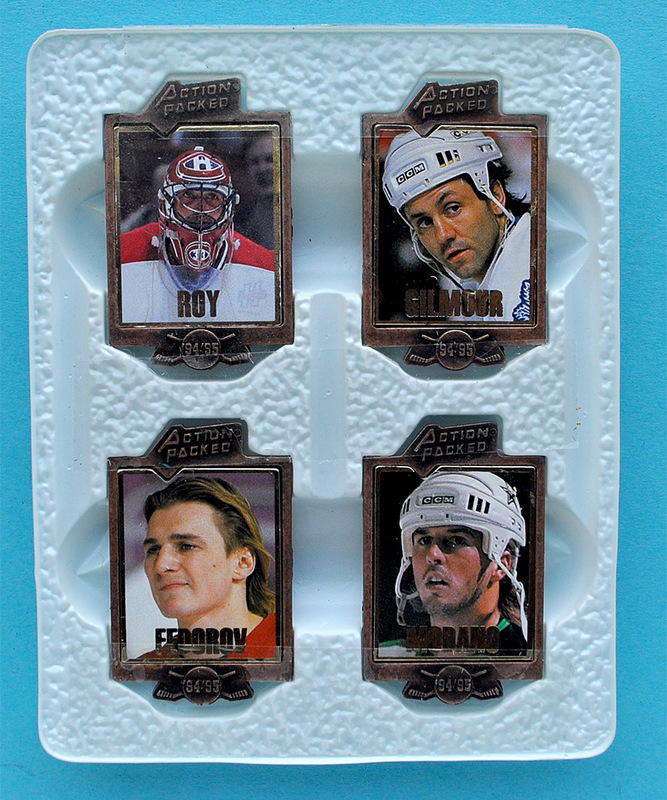 I would have liked to get one of these sample NHL 4 pin sets. Alex, thank you for your compliments, and the info about the Gretzky prototypes. I have never seen them before, but will keep a look out for them, and hopefully one day add them to my collection.